Some of you may or may not know, the NBA held a regular season game here in London a few weeks ago. Being one of few over here in the UK caught up in the whole ‘linsanity’ madness last season, I grew to really enjoy the game (the marketing worked thanks to the linternet….internet). The explosiveness of a coast-coast dunk, the breathtaking pause of a buzzer-beating, game-winning shot, or the beautiful set-up for an alley-oop, are all the theatrics that I love about the sport. So the moment I heard the New York Knicks were playing an away game against the Detroit Pistons all the way here in my hometown, I HAD to be there! I missed out on tickets for the London Summer Olympics Basketball games (actually make that for every sport I had applied to get tickets for). Gutted, I wasn’t about to miss this! No way Javier. Sadly as luck would have it, I didn’t manage to get my hands on any tickets, they sold out like ‘fiyah’! Who knew there were other NBA fans in London?! Now I can only hope that the NBA returns next year, or book a flight out to New York and experience the real atmosphere in MSG itself! And to be honest at the price tickets were selling for I think the latter would be more worthwhile. 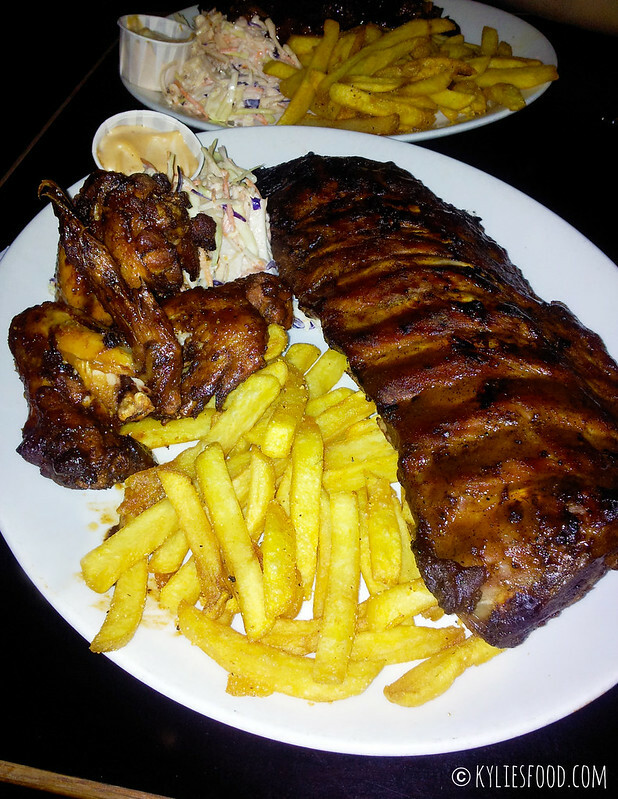 Back to this review, the next best thing, Bodean’s BBQ to the rescue! I didn’t even know this place existed, it served as a place where I could comfort my NBA sorrows with BBQ (and lots of it) whilst watching NBA. It made perfect sense. A bustling independent chain catering for your all carnivorous cravings and sporting needs – if that includes sticky American style BBQ ribs, wings, pulled pork, burgers, NFL games, NHL games, NBA games, beers and root beers, heck they even show football (the English kind). Anticipating the crowd, we went early and waited in the upstairs bar area with a Ginger Beer and a Canadian beer (I forget the name, something Moon). Surprisingly, there were only a handful of NBA fans – we noticed this as they were decked out in Knicks colours. The Pistons were clearly unloved here in London, it felt like we had adopted the Knicks as our home team. I was in my feeble attempt of playing NBA fan dress-up by wearing a Knicks jersey I had got lin….in the end of season sale with the number 17 on it – yes I hid. The majority of punters were office workers simply there to whine down and could not care less about this foreign sport which is loved so much across the Atlantic. The upstairs atmosphere did have an American bar feel, though I wouldn’t know having never set foot into a real one, this judgement is based on stereotype. They have three large plasma TV displays dotted in convenient spots around the modestly sized room. You can also eat up here if you like to rub elbows with fellow strangers, since the upstairs table arrangements are long bar type benches and stools, this made for a cosy atmosphere. The Soho branch gets particularly busy and only takes bookings for groups of 8 or more, so when we arrived at about 6.30pm we were told on arrival, that there was a time limit of an hour and a half on the duration you could spend in the downstairs restaurant – hence the waiting upstairs. However the staff were really nice, we told them we wanted to watch the game which started at 7.30pm and eat downstairs. The waitress took down our mobile number and said she’ll see if she can get us down there for the start of the game, as it was really busy, no promises were made. So we waited with our drinks whilst an influx of customers start to wander in as peak time beckons. At about 7.30pm we received a call, it was the waitress from downstairs informing us that there were seats available for us if we still wanted them. Happy and hungry, we went downstairs to find a full house and that she had got us a table right by the large plasma TV! Before leaving she told us with a smile that we could stay for as long as we like. Now that’s what I call customer service. Can you tell it was dark in here? We were introduced to our waiter, a very entertaining chap and probably the best waiter I’ve ever had, not too in your face and pushy but always attentive and sociable. Hungry we ordered right away, I went straight in for the ‘US game day special’ for £15 which consisted of ‘Buffalo Wings, A Full Rack of Baby Back Ribs, Fries, Coleslaw, and a Beer!’ I swapped the Beer for a Raspberry Iced tea. We also ordered the ‘Burnt Ends’ beef brisket with fries, coleslaw, dip and the Budweiser that came with my meal. The food came out prompt and I was welcomed with a full plate bigger than my head of BBQ goodness. I was thankful that my ribs and wings didn’t come drenched and smothered in sticky BBQ sauce like other American theme restaurants, as I feel the heavy sauce always overpowers the flavour of the meat. Bodean’s have their own special BBQ sauce at the table for you to add to your plate. Diving in, the ribs were really satisfying, and the wings fall of the bone tender. Though I’ve always wanted to try the orangey style Buffalo wings complete with blue cheese dip and celery sticks you see in the States (again stereotyping), these wings were succulent and flavourful. The crowd pleaser ‘Burnt Ends’ were really tender however lacked in the smoky barbecue grill flavour we had hoped for. They were also too sweet for our liking. Other than that everything else was dandy. Half way through the meal, we almost forgot about the game and let’s be honest there wasn’t much of a game. Half the time it felt like the Pistons were personally passing the Knicks the ball. After ploughing through and finishing our plates, we washed it down with another Iced Tea this time Passion Fruit! Completely stuffed there was no room for dessert in our small frames. Having been there for a while we left around 10.30pm before the game had finished, and were very satisfied with our visit. The service was excellent – one of the best I’ve experienced. The food was straight-forward, unpretentious and soul loving. The atmosphere felt relaxed with warm positive vibes all round. Almost made me not regret I had missed out on tickets, otherwise I might have never known about Bodean’s BBQ. Should my meat cravings kick in or if I ever feel to watch some stateside sports, I would definitely visit again.